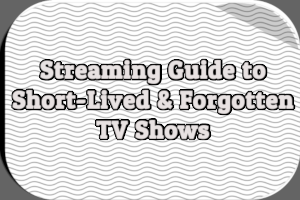 This long-running dramatic anthology debuted on ABC in 1953. 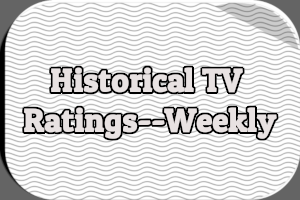 It moved to CBS in 1956, where it remained until going off the air in 1963 after 10 seasons. 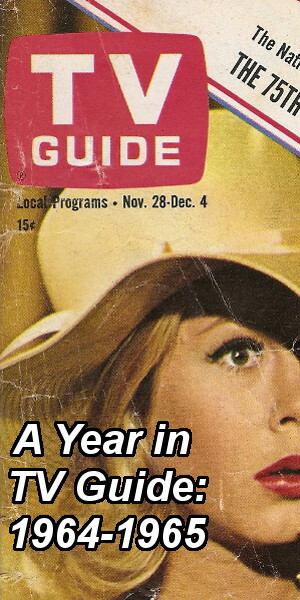 Aired live from New York City for its entire run, the series alternated weekly with other dramas. 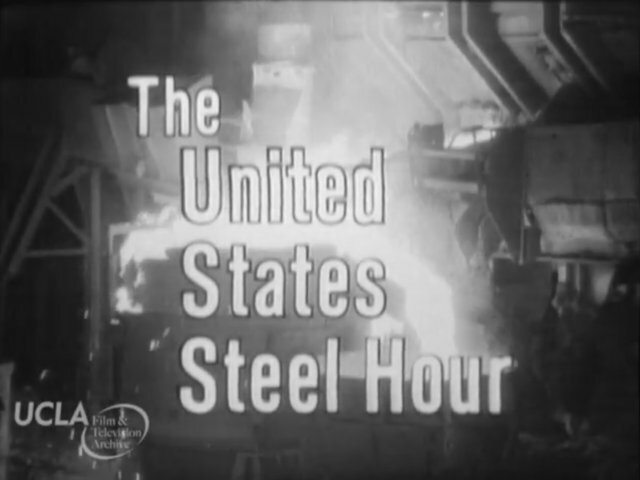 Like most dramatic anthologies from the Golden Age of Television, The United States Steel Hour has been all but forgotten. Gerta Blake has just moved to New York City to live with her brother Charles and his wife Betty. At a party, she meets the strange man who lives next door. His name is Horace Borden, a former child prodigy. Others may laugh at Horace and make fun of him, but not Gerta. She wants to get to know know her new neighbor. Boredon, as he prefers to be called, collects photographs from movies. He tells Gerta he prefers to be alone, he needs to be alone. He’s a freak. At 12 years old, he graduated college. He defended his thesis in front of adults. Eventually, Bordon asks Greta to look at photographs of William Holden his apartment. Charles is worried about the amount of time Gerta is spending with Borden. Gerta tells her brother she likes spending time with Borden. One day, she runs into Borden’s father. He begs her for help. His son is meant for great things. He could be the Einstein of his generation but not if he stays locked away in his apartment. Gerta promises to think about it. When Gerta mentions her encounter with his father, Borden runs back to his apartment. She follows. There’s a position open at Columbia. Borden is angry. He trusted her. Gerta can’t understand why he hides away. Borden tells her it’s because he knows he’ll never know enough. He’ll never be able to produce, to be The Prodigy everyone expects him to be. So, he hides. He hides from their expectations. He lives alone and he disappoints no one. 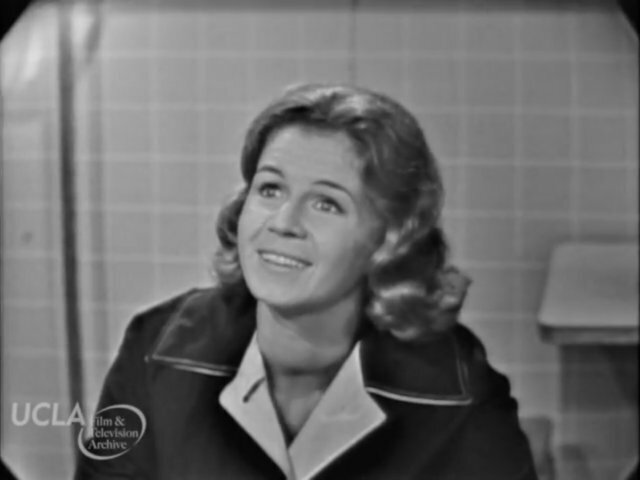 Gerta invites Borden to dinner with her brother and sister-in-law. Charles is less than enthusiastic but the dinner goes well. Borden even compliments a painting Charles made and understands it. He later tells Gerta he likes Charles and Betty and thinks they like him. He opens up to Gerta. He doesn’t understand love. She tells him love is easy. They kiss. But he gets upset when she suggests they’re just beginning. Borden needs to know what the end is. He’s always looking for the end. Gerta pushes Boredon to meet with his father just once and be done with it. He refuses. Some time later, Charlie stops by Borden’s apartment to invite him to a party for Gerta. A going away party. He declines but then shows up as the entertainment, putting in his prodigy act, calculating numbers and reciting Shakespeare. Gerta runs out crying. Borden goes after her, promising to do anything she says. He agrees to meet with his father. The meeting does not go well. Borden asks if his father loves him, if his father loved his mother. He asks if his father hates him for killing his mother by being born. Borden explodes at his father, calling himself a freak. His father leaves. Gerta begs Borden to come outside with her. Once again, he refuses. He stays in his apartment and talks to God. He decides he doesn’t want to be destroyed. Borden knocks on Gerta’s door and tells her he wants to come in. 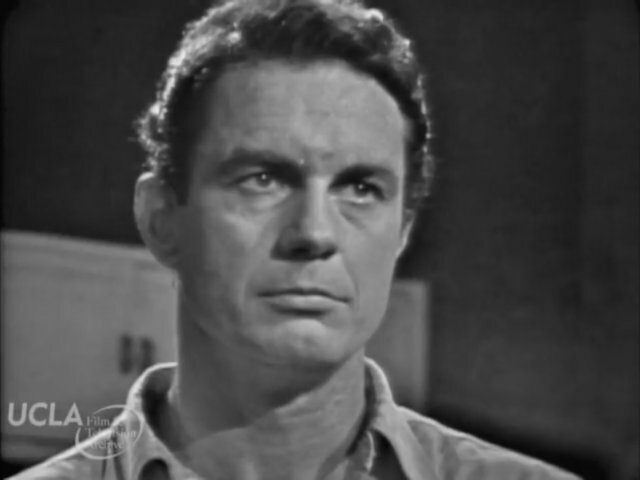 Cliff Robertson made four appearances on The United States Steel Hour between 1956 and 1961. “Man on a Mountaintop” was his last. He is superb in the role of Horace Borden, a genius who knows so much but doesn’t know how to interact with people, how to love, how to live in a world he can’t understand. 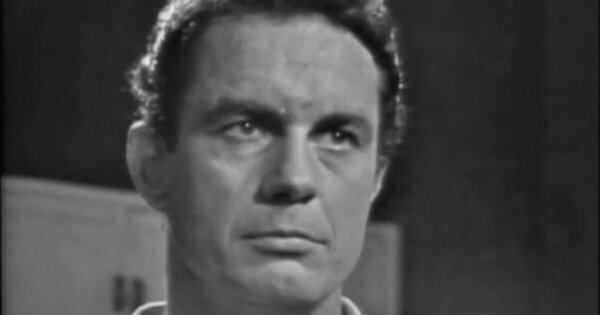 As the episode unfolds, viewers learn how Borden’s father used him as an experiment, endlessly teaching him without any affection in the hopes of raising the next Einstein. Only when talking to Gerta does Borden’s humanity slip through the wall he’s built around himself. It turns out he isn’t a machine after all. Salome Jens comes close to holding her own opposite Robertson, yet her character is one dimensional. Gerta’s only role is to push Borden to grow. She is the reason for his attempts to change throughout the episode, nothing more. 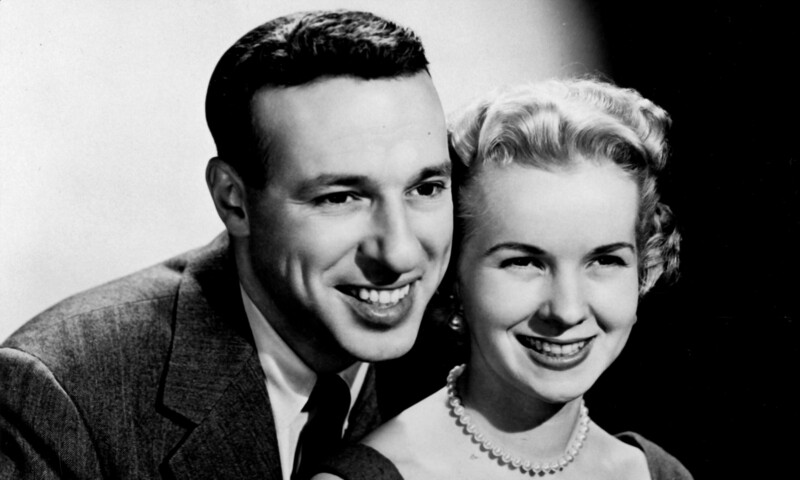 Robert Alan Aurthur penned “Man on a Mountaintop” in 1954 for The Philco Television Playhouse on NBC. Steven Hill played Horace Borden, with Loretta Leversee as Gerta Blake. 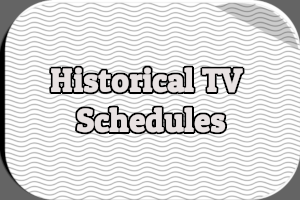 The episode aired on October 17th, 1954. It won the 1954 Sylvania Award for Finest Original Teleplay of the Year. The title of the episode is a reference to Philip Wylie’s 1930 novel Gladiator, which Borden references during the episode. Five months before this episode aired, the British dramatic anthology Armchair Theatre broadcast its own version of “Man on a Mountaintop” starring Don Borisenko and Susan Hampshire. The UCLA Film & Television Archive uploaded “Man on a Mountaintop” to YouTube in April. 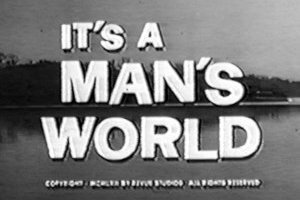 Do you remember watching “Man on a Mountaintop” back in 1961? Have you watched it recently on YouTube? Hit the comments with your thoughts and recollections.